1. How thoroughly will she be able to staff the polling booths with volunteers handing out her how-to-vote cards on the day? 2. How well has her team been covering the pre-poll station(s) with HTV cards? 3. What’s on her HTV cards – do they clearly preference the Libs or has she left it a bit vague? You’d think with only a single electorate to cover, she’d have the volunteers to do so; but there’s no guarantee they’re that efficient, and thus her HTV serving suggestion may not be that influential re how people actually vote. Why would Phelps have decided to preference libs higher in the first place? There has to be a rationale. The only one that makes sense is a calculus that po’d libs might protest vote for her but not if she preferenced the alp – and she wants those primary votes and otherwise didnt believe she would get them. To think that calculus is wrong to the degree that the majority of such voters will in fact preference the alp (which is what murray would need to win) seems to me to be the height of far fetched wishful thinking. She is depending on disaffected libs to get her into 2nd and the price for this is needing to pref sharma over murray, or else they wont vote for her. Res ipsa loquitur… she has aligned her htv that way, and the alp is running dead. The odds that both are wrong and prefs will flow contrary to their beliefs are surely very low. Rather than pipe dream some unicorn scenario, surely the rational choice is to back both those judgements? Expat Follower, I have to say, you’ve persuaded me on the soundness of Labor’s strategy in this campaign. 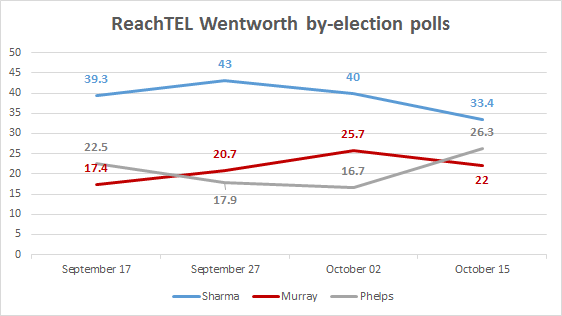 Really, a Phelps defeat of Sharma on Oct 20 amounts to a victory for Labor. Phelps MP will be assailed tooth and nail by the Liberals all the way to the general election, giving her every incentive to take opposing stances against them at every opportunity. She could scarcely do more for Labor’s cause even if she was an officially endorsed Labor MP. Plus, think of the resources she would drain from the Liberals in their desperation to get “their” seat back. A Phelps win on Oct 20 is all upside for Labor and all downside for the Liberals. Mind you, this is a separate question to the one of judging what the Labor-Liberal TPP vote will be, irrespective of who the final TCP count is between. I think it will be a lot closer to 50-50 than the conventional wisdom holds. Maybe even 51-49. 3CP indicative counts should be decided in a similar fashion to 2CP indicative counts. Seats where the top 3 are not clear going into election day are very rare. Morwell in the upcoming Victorian state election and at Commonwealth level possibly Richmond in Northern NSW in potential future contest where the ALP Greens National and Liberals were all fighting it out. Getting John Howard out of retirement to campaign is not desperation. No! But with Wentworth being young and progressive, does it make any sense for Sharma to align himself with Howard? Doesn’t it just underline Phelp’s attack on the Liberal’s lurch to the right? I think they are gone. Since ScoMo took over, there is a narrative of desperate flailing and an integrity vortex that is taking hold. The echo chamber here have been firm in this from day 1, but im talking amongst swinging voters and moderate libs. Losing Wentworth just further cements it all. ALP dont need it to win the nxt election, but boy it will lock in these notions of panic + dysfunction + lack of control + “surely have to go” amongst those voters that actually deliver the ALP victory. A sure indicator in the inevitability of this govts death spiral, if you will. Mind you that didnt hold true when Hawkes seat went indep after he was tossed, but given that it costs this govt its working majority this is different. Massive symbolic and perception value – and will lock in govt panic and desperation. Not to mention that their ability to pass any legislation is compromised. I think Sharma is a 50-50 bet to hang on, but know only Phelps can win it if he doesnt. So any attempt here by alp afficianados to spruike a murray vote i think is a self-inflicted kick in the groin. Labor had PM Paul Keating flaying Lettuce Leaf Hewson back in 1992; the Liberals have ScumMo confronted by the calm, reasonable Bill Shorten today. Big difference there – a decisive one.